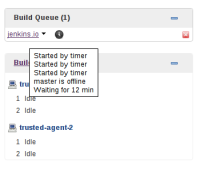 Our own Jenkins Pipeline projects seem to be getting stuck in this state of "master is offline" when attempting to run on our clusters which have zero executors assigned to the master node. Jesse Glick What's the bug? That the node monitors work? That flyweight tasks don't run on marked-offline nodes? Daniel Beck added a comment - 2016-05-19 19:40 Jesse Glick What's the bug? That the node monitors work? That flyweight tasks don't run on marked-offline nodes? I guess that the master node should be displayed when it is offline. Jesse Glick added a comment - 2016-06-06 21:59 I guess that the master node should be displayed when it is offline. Daniel Beck added a comment - 2018-02-19 00:30 Released in 2.108.